Welcome to The Abso!ute Sound online! We explore music and the reproduction of music in the home. We believe that the sound of music, unamplified, occurring in a real space is a philosophic absolute against which we may judge the performance of devices designed to reproduce music. Our goal is to provide the resources consumers need to judge how a component's sound either honors or departs from the music's truth, and to make sound purchasing decisions that maximize their experience of reproduced sound. Below is our Issue 190, February 2009 contents and editorial. A sneak preview of the best high-end products coming your way. Denon adds an SACD twist to the compact audio system. Wayne Garcia reports. JV on what may be the world's best phono cartridge, the Air Tight PC-1 Supreme. What does $500 buy you in today's speaker market? A surprisingly high level of performance, says Steven Stone. 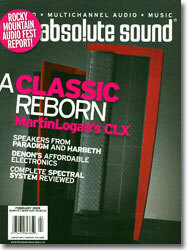 Neil Gader on a pair of great-sounding and affordable products. Robert E. Greene on an updated version of one of his favorite speakers. Great CD and SACD sound in a gorgeous package, says Neil Gader. Jonathan Valin on this 21st Century version of an audio classic. Robert Harley auditions a complete system from high-end audio's most enigmatic company. Spectral Audio Founder Richard Fryer and Chief Designer Keith Johnson get candid with RH. Sure, they're wildly expensive, but MIT's tops-of-the-line are worth every penny, says Robert Harley. HP ruminates on describing the sound of transparency. William Elliott Whitmore: Animals in the Dark. We talk with William Elliott Whitmore. Also, reviews of new CDs and LPs from A.C. Newman, David Byrne and Brian Eno, Heartless Bastards, Pavement, El Guincho, Belle and Sebastian, J. D. Souther, Crystal Antlers, and Frida Hyvonen. Plus, a deluxe Cheap Trick reissue and audiophile vinyl from Metallica and Megadeth. A recent SACD of Strauss's Alpine Symphony, a new Schubert lieder disc, Joyce DiDonato's Furore, and Erwin Schott's debut aria album. Alex Cline's Continuation and Nels Cline's Coward. Plus, reviews of a new Sonny Rollins archival release, Bill Carrothers' Home Row, and Charlie Haden's Rambling Boy. Luke Manley of VTL talks with Neil Gader.